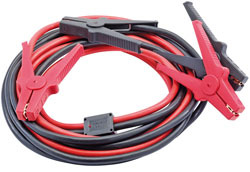 Suitable for 12V and 24V cars and light commercial vehicles. Heavy duty copper coated cable (25mm²) fitted with inline anti surge protection and heavy duty insulated clamps. Display packed in zip storage bag.